do o2 customers not get free wifi from bt phoneboxes? the chrystal bell at glasgow cross now has free wi fi. banjo wrote: the chrystal bell at glasgow cross now has free wi fi. Wouldn't fancy bringing a laptop or smartphone out on there Banjo, too many dodge characters in that end of the town. A copy of Backtrack on CD or DVD, along with a wireless card card capable of a little jiggery-pokery plus a little know how should solve the problem. That was probably true when posted, which was nearly seven years go, but not now. I remember when you could log in almost anywhere in Edinburgh, whose wifi users seemed even less security conscious than Glasgow ones, but that's not the case there either now. For the last year i have been running a program on my phone as i have been walking about town. Here is a small snapshot of some road junctions with the open/closed AP's plotted. Sometimes the GPS is a bit off so the points are not perfect. I removed the roads to see if anyone can guess where it is. If anyone wants a specific area i have while i am making the bigger set i can drop screenshots from the phone easily enough. is that along Gt Western Road and stuff? For all those with Android phones. 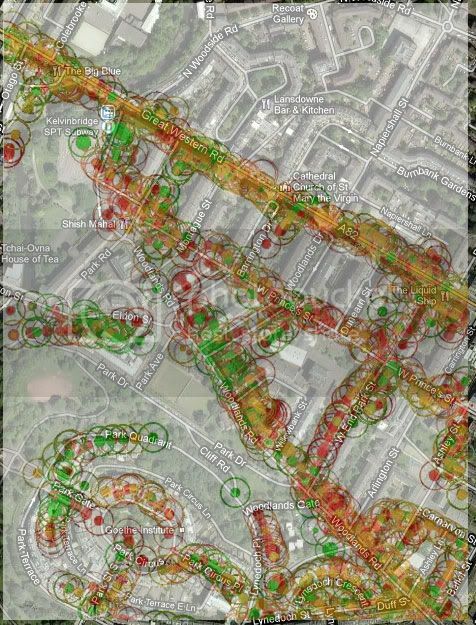 "The BBC is conducting a major survey into the state of mobile phone coverage in the UK. Over the course of the next month, the project will attempt to chart the availability of 3G and 2G services up and down the country. Mobile operators offer their own coverage maps but no independent survey has yet been carried out. 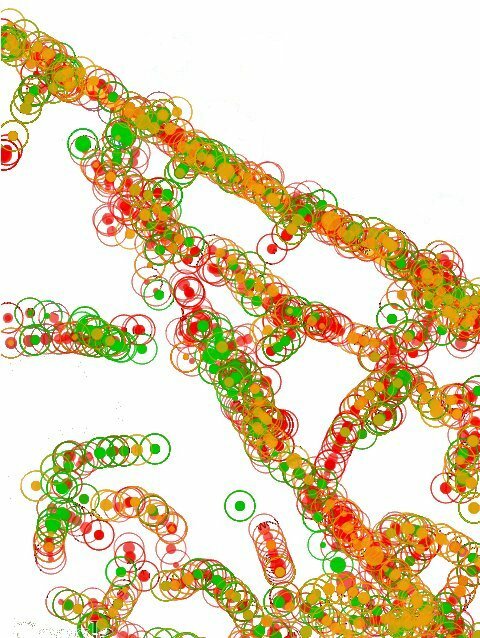 Measurements will be made using an app developed by network analysis firm Epitiro." If you have any privacy concerns read the licence and remember the phone company knows where you are every 5 seconds or so anyway. For anyone interested i used the app wardrive (https://market.android.com/details?id=ki.wardrive)on an android phone to create the maps above. If you do install it let me know and i will tell you some tips on running it to make your battery l;ast longer. wifi,gps and app running can use batery life fast. Free WiFi in The Trees restaurant upstairs on Union Street. MungoDundas wrote: Free WiFi in The Trees restaurant upstairs on Union Street. Do they still do a lovely mince n totties?